In August, 14th-16th 2018, the faculty of economics and business of UGM conducted various events in order to prepare the reaccreditation of AACSB in February 2019. The event is named by AACSB week, where contained some events such as dissemination session, ambassador for AACSB visit’s booth, and some competition event in photography, essay paper, video maker, and quiz. 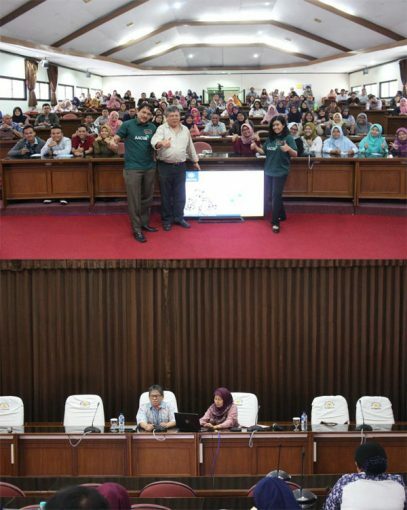 In the AACSB week, MD FEB UGM had a chance to do the dissemination session with masters and doctoral students of FEB UGM. The first day of the dissemination session is presented by Professor Jogiyanto Hartono, Ph.D. with the masters and doctoral students in accounting, while the second day of the dissemination session is presented by Professor Catur Jogiyanto, Ph.D. and Eny Sulistyaningrum, Ph.D. with the masters and doctoral students in economics. The third day is presented by Nurul Indarti, Sivilokonom, Cand. Merc., Ph.D. with the masters and doctoral students in management. In the dissemination session, MD FEB UGM learning goals (LG) and learning objectives (LO) were also disseminated to the students. This session is important because in AACSB accreditation, it is basically referring to the level of the LG and LO reports of the students, so it is important that the students know that they were assessed in these regard (LG and LO).